Corporate Art: Earn What You're Worth! Earn What You're Worth Finally! Enter the Fascinating and Prestigious World of the Corporate Art Consultant! Corporate Art Design is one of the most exciting, fun and lucrative businesses in existence for the time invested. It a world of beautiful, decorative art, custom designed to enhance a business' decor and promote their image to all visitors and employees. It's a highly specialized area of design that, when done right, has few competitors. Traditional interior designers generally don't bother with planning the art for a business because it is very time consuming for them and they usually don't have the right resources. The executives at the company don't know how to coordinate art for the facility and they certainly don't have the resources, nor the time and energy. That's why there is such a need for highly trained, professional corporate art consultants in any busy metropolitan area of the country. "Very pleased with the consulting work and happy with the art work selected and installed. Will use again as needed. Excellent to work with, diligent and good results from your efforts." - JMB Financial Managers, Inc. Finally you can . . .
Have more time and money to travel! Live in style in a new home! Drive the car you've always wanted! Make extra money without spending it all on daycare and gasoline! But where does one go to get trained properly? To a local art gallery? Absolutely not. The typical gallery owner or clerk doesn't know anything about interior design. They know how to frame a work of art, but they haven't a clue where it should be hung, nor how to pull a professional concept together for a business client. To an interior design firm? Wrong again. They have the design knowledge but lack the sources and the training on how to effectively and professionally custom frame, deliver and install the art. So where does one go to learn this specialized area of interior design? Until now there wasn't anywhere you could go! 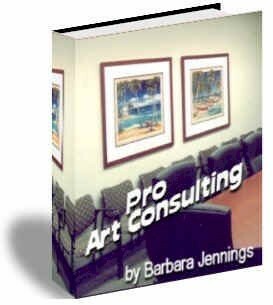 But now, at last, there is a one-of-a-kind electronic book that will teach you the A-Zs of decorative corporate art consulting and exactly how to start a consulting business from your home, working part time or full time, and how to design an art concept for a business, plus how to manage and grow your business. For more information on this fascinating, high paying field, click on the link below.